Learn How to Make a Japanese Origami Doll! 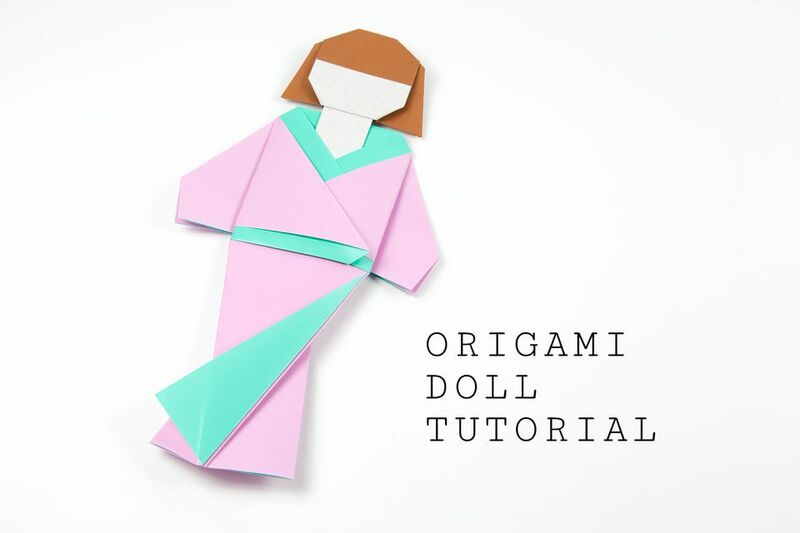 These pretty origami dolls are wearing a Kimono inspired outfit! They are perfect gifts for many occasions such as birthdays, Mothers Day, Valentine's Day and even weddings. If you can get your hands on some paper that has one color or pattern on one side and a different one on the other, it gives the dress a lovely two-toned effect. For the head, it's great if you can find some paper that has a hair colored side and a white side. You'll need 2 sheets of square paper for the kimono and 1 sheet of square paper for the head. Sizes: Kimono: 17 x 17 cm. Head: 12.5 x 12.5 cm. Alterative size: Kimono: 15 x 15 cm Head: 11 x 11 cm. We will be starting with the outer part of the kimono. 1. Start with your paper white side up, this color will be on the collar and belt. 2. Fold your paper into an S shape and adjust it into thirds. Slowly shift the layers back and forth until they are equal. 3. Pinch the paper once you are happy that they are thirds. 4. Place your paper back down. 5. Fold the right edge over to the mark that you created. 6. Flip the paper over to the other side, from left to right. 7. Fold the right edge over to the left edge. 8. Rotate the paper clockwise. 9. Open out the top flap down. 10. Fold the bottom left and right corners diagonally up to meet the crease. 11. Re-fold the bottom edge up to the top. 12. Fold the right edge over to meet the top of the diagonal line, unfold. 13. Do the same with the left edge. 14. Open out the right section from the bottom, separating out to the left and right. 15. Complete the squash fold, making sure it's neat. 16. Repeat the same on the left section. 17. Fold the 'sleeves' inwards a little, or leave them as there are! 18. Reverse fold the little flaps you just made. 19. Open out the front of the kimono. 20. Unfold the top layer back down, then refold it back up, this time leave a gap at the top. You can make this gap as large as you like, for different end results. 21. Re-fold the front flaps. 22. You can create different arm positions, fold the arm behind. 23. Next, pull the arm back out, leaving a small gap at the bottom point. 24. This arm position is the most basic, you can have the arms folded over to the front, or have one of each. Now we will make the inner kimono. Again start with the white side facing up. 1. Create thirds the same way as you did for the outer kimono. 2. Fold the right edge over to the mark you made. 3. Fold the left edge over to the right edge. 4. Fold the top right corner of the front layer down to the left. 5. Open out the front layer to the left, fold the top left corner of the top layer down to the right. 6. Re-fold the left section over to the right. 7. Open out the outer kimono and insert the inner kimono. 8. You can adjust the height of the collar by sliding the inner kimono up. 9. Flip the model over to the other side, fold the left and right corners of the collar down. 10. Fold the top of the collar down to meet the top of the outer kimono! 11. Flip the kimono over, now we can adjust the lower part of the kimono. You can fold the top flap diagonally over to the left. 12. In this example, the right section was folded behind and then part of it was folded back out again, on both sides. Now for the final part - the head of your origami doll. Start with the hair color facing up. Alternatively, you can use white paper, coloring the hair at the end. 1. Create thirds using the method you have used twice previously. Fold the right edge over to the crease. 2. Fold the left edge over to the right edge. 3. Fold the right edge back to the left. 4. Do the same with the flap underneath. 5. Open out the paper back to the start and flip it over to the other side. 6. Fold the bottom right corner up diagonally to meet the 'third' crease. 7. Create a small pinch by folding the top edge down to meet the horizontal edge of the flap you created in the last step. 8. Unfold the bottom right corner and fold the top edge down to meet the pinch you just created. 9. Flip the paper back to the other side. 10. Re-fold the left and right flaps. 11. Flip the paper over to the other side. 12. Fold the bottom edge up to the top and unfold. 13. Rotate the paper anti-clockwise (to the left). 14. Fold the top and bottom edges to the middle, just the right side as shown. 15. Rotate the left side back up to the top. Fold the bottom section up and behind. 16. Fold the bottom left and right corners diagonally in, aligning with the crease you made in step 14. Unfold. 17. Flip the bottom edge up, bring the bottom section out from behind, aligning with the top of the diagonal folds you created in the last step. 18. Fold the lower right and left sections to the central crease. 19. Flatten the little triangles which should magically appear when folding. 20. Fold the bottom left and right corners of the top section in diagonally and unfold. 21. Grab the top right corner flap and bring it down to the left. 22. Put your finger in to make a diagonal crease on the inside. 23. Pull on the flap even more, angling the 'hair' down to the right. If you have serious trouble with this step, you can also make a small snip with some scissors, on the inside. 24. Turn the model over to the other side, refold the corner of the face behind. 25. Repeat the process on the other side. Fold the top left and right corners behind to round out the head. 26. Optionally, you can fold the ends of the hair behind or trim them. 27. Finally you can pop the neck into the kimono. Depending on how thick your paper is, you may need a dab of glue to secure the head.